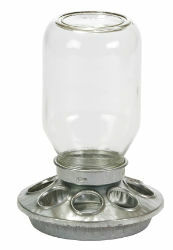 This gravity chick feeder comes fully assembled and features a glass mason jar. Easy to fill and clean, it holds 1 quart of feed. The base is made of heavy-duty galvanized steel with rounded, embossed edges to help reduce chafing on chick’s neck and head. Base includes eight feeding holes.